Since I was a child, I was amazed by bookstores–hundreds of shelves, stacked (seemingly) from floor to ceiling, the soft, comfortable chairs where I spent hours pouring over which book to buy, the crackling sound of a binding for a book that had never been opened. I loved the fact that you could open a book’s cover, and be instantly transported to another world and/or time–one where dragons, goblins, and faeries interacted with humans, or aliens helped humans learn how to overcome their shortcomings. Even the stories that were closer to home (though still half a world away) were fascinating to me–such as those describing life in a tribe in Africa, or chasing kangaroos through the outback of Australia. Bookstores were magical places, where I could be transported wherever I wanted–and I’ve always felt that owning/running a bookstore was in my future. Besides being a writer, and loving to create worlds, I’ve also wanted to help others find the worlds they want to experience. While I still don’t own a physical store, we now have a virtual store here at WritAnon. Inside, you will find a section where we feature various books, movies, and other items that are outstanding in their class. Since the WritAnon Store is powered by Amazon, we also have access to vast libraries of books, music, movies, video games, electronics, and other items, so you’re sure to find what you’re looking for. Times have changed from when I was a child. Less time is spent in books, and much more is spent on the Internet. We have access to the equivalent of thousands of libraries, typically from the safety of our own homes–all that needs to be done is a quick search via Google or some other search engine. We have more information, but the real magic is still in books–something you can curl up with on a couch in a sunny (or dark and stormy) window. When you decide to make your next book, music, or movie purchase, consider using the WritAnon Store. Then, feel free to check the forums to see what other discussion (or magic!) is going on there. One month after setting some end of year goals for WritAnon, I’ve decided to give you an update on how close we are to accomplishing those goals. We’re doing fairly well on this front. I feel very lucky to have several members who are very active in the forums, who are willing and able to answer each other’s questions and give advice/comments on various posted stories. The flurry of activity in the forum has sometimes been difficult to keep up with, which is an excellent problem to have–I’ve been very grateful to have such talented writers debating topics in the forum. I’ve also enjoyed the imagination shown by those who have submitted various stories. We’ve also had a few inspirational stories submitted by forum members. This is a big benefit for the site–visitors will be able to get several points of view for finding inspiration. There is still a lot of room to improve on this goal (which is not completely unexpected, since we are only about 6 weeks old). To this end, we have added Google advertisements to let our users know about related sites/services. So far, this has been our primary source of income. However, we have several new features that are now available, such as our Private Forums, Editing Services, and our new WritAnon Store. The WritAnon Store is a new addition this week. If you are planning on purchasing books, movies, music, video games/consoles, computer, or other electronic devices, please consider using the WritAnon Store. The WritAnon Store is powered by Amazon, so you will pay the same price for items at our store as you would at Amazon. WritAnon gets a small percentage of the purchase price of each item, so this is a great way to support our site. We’re making progress towards this goal. We have already increased from 8 to 12 members in the past month (a 50% increase!). When I set this goal, I knew it was aggressive. However, if five existing members tell five of their friends, and each friend tells five of their friends, we will already be at 125 potential members. I’m amazed at how global WritAnon has already become. So far, we’ve had visitors from 10 countries on 5 continents–if you know someone in Africa or Antarctica, then we can round out all 7 of the traditional continents. However, I’m thinking that Antarctica may be somewhat unlikely. Here in the United States, we’ve had visitors from 20 states, which is pretty good coverage for a month. While we’ve made some good progress, we need your help to get to 200 members by the end of this year. Please Refer a Friend, post flyers, and mention WritAnon to any friends or family members who like to write. So far, I’ve been hitting this goal every week (with a bonus July 4 posting). For the most part, I’ve been focused on implementing new features for the site rather than writing blog postings. As I finish wrapping up a few additional features, I hope to be able to update with additional bonus posts as time goes on. Inspiration can strike at the most unexpected of times, and in the most unexpected of ways. This morning, as I went downstairs to check on the overnight activity on WritAnon, I passed by the door to my garage. The door chirped at me. This not being a normal occurrence, I paused, and sure enough, it chirped again. Now, I’m not certain about other people’s houses, but doors tend not to chirp at my house (nor at any of the other places I’ve stayed), so I decided to investigate. As I entered the garage, I discovered that the chirping was not coming from the door, but was actually coming from the other side of the garage…apparently from my grill. Having grilled chicken not too long ago, I wondered for a moment if the chicken’s spirit had come back to haunt me. Perhaps, like a phoenix, a chick had risen from the ashes. In case I needed to flee quickly from an old chicken spirit (or a baby chick), I opened the garage door. Deciding an encounter with the spirit of a dead chicken was unlikely, I slowly continued over to the other side of the garage, and opened the hood of the grill (just in case)…it was indeed empty. 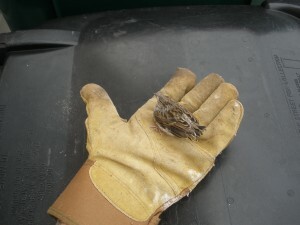 However, the chirping stopped when I opened that hood, so I knew that I must be close to its source. I moved everything away from that edge of the wall, but could not find the source of the chirping noise. Finally, I noticed that I’d leaned up an old board against one of the windows, and decided to move that–sure enough, a small bird desperately flapped its wings, trying in vain to escape through the (unfortunately for the bird) solid window. The poor thing had most likely been trapped in the garage all night. The bird was a young house sparrow…so common in this area that the birds are immediately recognizable. In fact, outside my office, I have a birdhouse where these sparrows nest…and I deduced correctly (as I later found out) that this bird had originated from there. I thought about giving the poor bird some time to find its way out, but knew that if I did that, I might end up being late for work…something that would not be beneficial from a financial perspective. Spotting a pair of sturdy leather gloves nearby, I decided to take matters (or the bird, as the case happened to be) into my own hands. However, guessing that few would believe this story without some evidence, I first grabbed a camera. I snapped this shot just prior to attempting my capture of the bird. Understandably, the bird was less than pleased when I approached. Being approximately 24 times bigger than something else is apparently an intimidation factor. I also get the feeling that the bird may have known the chicken, and feared a similar fate. Luckily for the bird, I generally buy my chicken at the store, and prefer my birds a bit larger before eating them. 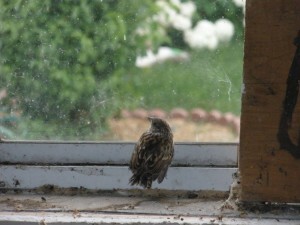 The poor bird flapped its wings in a panic, trying to escape through the (still solid) window. I spoke soothing words to it, something along the lines of “Don’t panic. I’m here to help, not to eat you. You’ll be fine in a few moments.” For some reason, this didn’t seem to ease the bird’s concerns. However, especially for a young bird, constantly flapping its wings quickly wore it out. Soon, I was able to pick it up (ever so gently) without protest–the poor bird was so tired that it could hardly stay awake. Or perhaps it hyperventilated and passed out…I’m not really an expert in these matters. There I was, an unconscious bird in hand, as I walked outside. Almost immediately, I also noticed two birds (adult house sparrows) in a nearby bush, and thought about an old saying, but decided against speaking it aloud. The birds probably wouldn’t have gotten it anyhow. Since I was now holding the bird in my hand, it occurred to me that this, too, might sound unbelievable to someone listening to the story. I decided to pull the camera out of my pocket and collect more photo evidence. After a few moments of rest, the little bird started chirping again. The (presumed) mama bird immediately flew over, landing on the ground near my feet. I didn’t have a chance to catch this picture…the second I moved, she flew away. Still, I could tell she was less than pleased. Since cats roam our neighborhood freely, I didn’t really feel like rescuing a bird only to have it immediately eaten by a cat. I allowed it to continue to rest for a few moments, then it finally decided to fly away. I saw it rejoin its mama bird, so I assume that all is now right with the world. Use small acts of kindness as inspiration into your own stories. You never know when inspiration will chirp at your door. Updated blog layout (you knew something looked different!) to integrate more closely with the rest of the site. Added new Young Adult forum. Added a Reddit and Tweet this! link to the bottom of each blog and inspirational post. If you liked this (or any other blog or inspirational post), please share it with others!